NASA's Chandra X-ray Observatory located a cosmic "ghost" that scientists think is evidence of a huge eruption produced by a supermassive black hole equal in power to a billion supernovas. The source, HDF 130, is over 10 billion light years away and existed at a time 3 billion years after the Big Bang, when galaxies and black holes were forming at a high rate. The X-ray ghost, so-called because a diffuse X-ray source has remained after other radiation from the outburst has died away, is in the Chandra Deep Field-North, one of the deepest X-ray images ever taken. "We'd seen this fuzzy object a few years ago, but didn't realize until now that we were seeing a ghost", said Andy Fabian of the Cambridge University in the United Kingdom. "It's not out there to haunt us, rather it's telling us something – in this case what was happening in this galaxy billions of year ago." Fabian and colleagues think the X-ray glow from HDF 130 is evidence for a powerful outburst from its central black hole in the form of jets of energetic particles traveling at almost the speed of light. When the eruption was ongoing, it produced prodigious amounts of radio and X-radiation, but after several million years, the radio signal faded from view as the electrons radiated away their energy. However, less energetic electrons can still produce X-rays by interacting with the pervasive sea of photons remaining from the Big Bang – the cosmic background radiation. Collisions between these electrons and the background photons can impart enough energy to the photons to boost them into the X-ray energy band. This process produces an extended X-ray source that lasts for another 30 million years or so. "This ghost tells us about the black hole's eruption long after it has died," said co-author Scott Chapman, also of Cambridge University. "This means we don't have to catch the black holes in the act to witness the big impact they have." 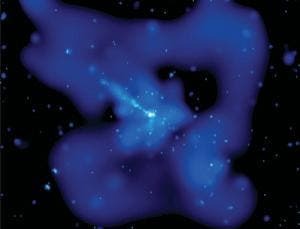 This is the first X-ray ghost ever seen after the demise of radio-bright jets. Astronomers have observed extensive X-ray emission with a similar origin, but only from galaxies with radio emission on large scales, signifying continued eruptions. In HDF 130, only a point source is detected in radio images, coinciding with the massive elliptical galaxy seen in its optical image. This radio source indicates the presence of a growing supermassive black hole. "This result hints that the X-ray sky should be littered with such ghosts," said co-author Caitlin Casey, also of Cambridge, "especially if black hole eruptions are as common as we think they are in the early Universe." "Even after the ghost disappears, most of the energy from the black hole's eruption remains", said Fabian. "Because they're so powerful, these eruptions can have profound effects lasting for billions of years."